Cook the Sirloin steak according to package directions. While steak is cooking prepare the rest of the ingredients. Mix basil mayo ingredients together. Slice and saute the onions for 8-10 mins. until they start to brown nicely. Slice and saute the mushrooms in a small amount of oil for 2-3 mins. Let the steaks rest for several mins. the slice the steaks into thin strips. Slice buns open. Optional – brush buns lightly with olive oil and toast them on the grill or on a flat skillet. On the top portion of the bun layer the following ingredients – basil mayonnaise, tomato slice and onions. 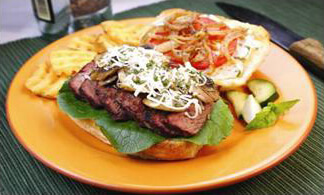 Place the lettuce on the bottom portion of the bun and top with the steak slices, mushrooms and shredded cheese.